What do logos on Scottish salmon with ‘responsibly’ or ‘sustainably’ farmed mean? Aquaculture has grown since the 1970s to form £1.8bn of the Scottish economy. Open net pens in salmon farming can have significant environmental impacts. Best Fishes seeks to engage with the current environmental concerns associated with Scottish salmon farming. The main aim of the project is to highlight these issues with consumers and retailers. As part of this we are asking consumers to question where their salmon is from and how it has been produced. We are asking retailers to keep improving their sourcing and transparency, the industry to keep improving its standards through innovation and best practice, and the regulators to ensure standards are adequate and regulations are being enforced. The project was established by Fidra, an environmental charity based in East Lothian, Scotland. We use scientific evidence and research best practice to establish a wider dialogue and determine how best to influence positive environmental change at national and international levels. Scottish salmon farming has grown steadily since the 1970’s and is now a major part of Scottish aquaculture, which has a present worth of over £1.8bn annually and provides more than 8,000 jobs. Scotland is the largest producer of farmed Atlantic salmon in the EU and the third largest in in the world after Norway and Chile. 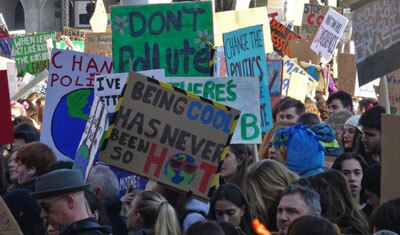 With around 1.5 million children striking from school on Friday 15th March 2019, conversations about climate change have been brought firmly into the home and around the dinner table. But how does climate change affect what is on our dinner tables in Scotland? We explore how climate change will impact Scotland salmon farming. SEPA released their draft Finfish Aquaculture Sector Plan for consultation at the end of 2018. Our response insisted that SEPA, as the regulating body, make a greater commitment to transparency throughout the industry with an emphasis on publicly reporting the use of chemicals, detailing the enforcement actions and repercussions and cumulative impacts on specific locations. Closed Containment – a silver bullet for both opponents and supporters of salmon farming? Current methods of Scottish salmon farming traditionally use an open net method, yet companies are now looking into closed containment, or land-based, farming to limit environmental impacts. he Scottish Parliament's REC Committee report on salmon farming in Scotland is out at last! No moratorium on expansion, but some good recommendations.